Scotch Review 700 is here and it’s a good’un. Benrinnes has always been a firm favourite of many for its meaty, slightly sulphury notes from the partial triple distillation they did pre-2007. Of these, the 1985 vintage, 2009 special releases of the 23 year old is known, particularly on Reddit, as one of the best Scotch bottlings ever, with multiple scores of 100/100 and some other damn high ones besides. 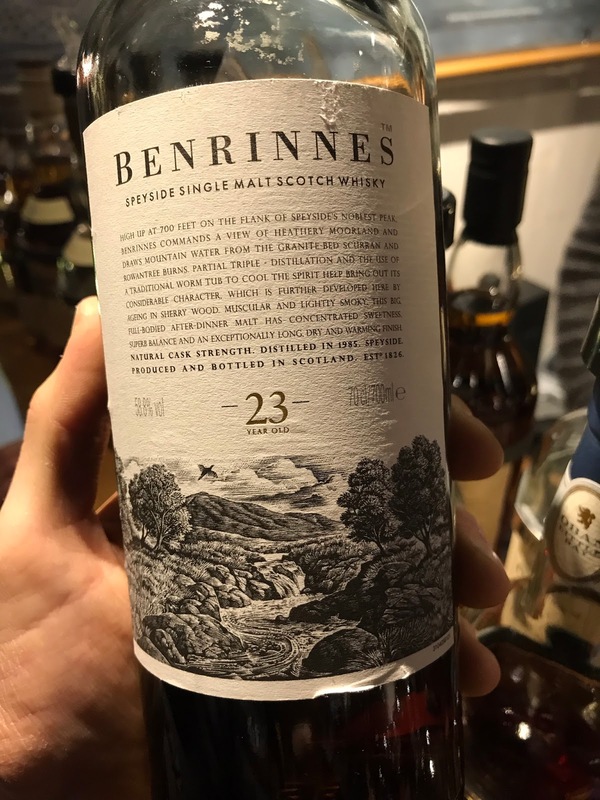 Luckily I managed to pick up a bottle in Scotland a while back for a not ridiculous sum of monies, but I’ve always been curious to how it tastes without having to open my precious bottle… Had a chance to try it at Bottle Market in Bremen recently. Let’s have a warm up first shall we? Nose: Delicate and light, with some underhand heating it gives more gristy meatiness, grain whisky-esque otherwise, malt and lemon. Taste: Crisp and clean, great green apple note, very fresh, then more muscular with oak, red apple, oily mouthfeel, malt and lemon. Finish: Medium/Long length. Lovely finish. Great oily malt, soft chocolate and heather and lemon. Great balance here. Shame the nose is a bit light for my taste, still, the finish is spot on. Nose: Complex. Powerful nose with lots going on. Old school heavy spirit and old school heavy Sherry. Red apple and black pepper, dried blood, truffle chocolates, earthy malt and leather. More leathery as it opens up with old polished furniture. Water: A little lighter with more ethereal sweetness, more oak but still not too much, Old Balvenie-esque orange and old wood panelled library, musky, pretty much keeps developing endlessly. Taste: Powerful and thick. HUGE mouthfeel! Massive whisky. Oily for days, red apple, black pepper, rich Sherry, cherry, somehow it’s all in balance too! Slightly mineral pockets of flavour too. Water: More balanced arrival, builds slowly now, more sweetness, more Sherry, raisin, more dry oak too. There's a little sharpness in the mid-palate now but it’s so so minor. Finish: Long length. The oils! More chocolate, more meatiness here, chewy. Gravy? Perhaps... Malty gravy. Pretty damn great. 2009 Special Releases. What can I say? Legendary. A damn sight better than the 21yo release from a while back. Its sweeter, more muscular, better balanced and with more power. Very glad I’ve got a bottle tucked away.